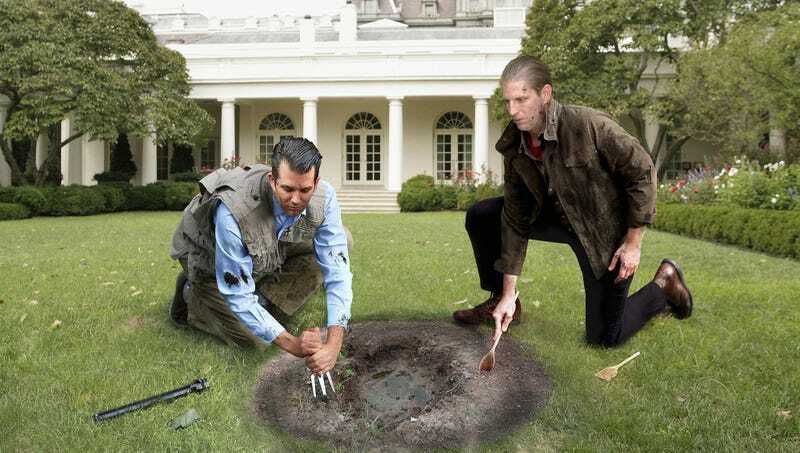 WASHINGTON—Armed with all the special tools they’d need for the mission, Eric Trump and Donald Trump Jr. on Wednesday were reportedly attempting to build a tunnel from the White House South Lawn to FBI Headquarters in order to free Paul Manafort from custody. “We’re gonna sneak into the jail from below, rescue him, and escape before the guards know what hit them,” said Eric Trump as he and his older brother sat on their hands and knees, scraping at the grass and dirt with soup spoons they had taken from the kitchen and a trowel they had found in the Jacqueline Kennedy Garden. “We’ll use the firecrackers to blow a hole in the floor of his prison cell. Then, once we’ve nabbed him, we’ll throw down thumbtacks behind us in case they try to chase us back to the White House. If we skip dinner, I bet we can make it there by nightfall, so we’d better get some snacks too.” Upon learning Manafort was placed under house arrest, the brothers reportedly abandoned their 4-inch hole in the lawn, but said they’d finish the escape tunnel next time the FBI kidnapped someone.